Game 19: Nationals Park, Washington, D.C. If we’re going to talk about the Nationals, we have to talk about Stephen Strasburg. And if we’re going to talk about Stephen Strasburg, we’re going to have to talk about baseball cards. So, let’s talk about baseball cards. Baseball card collecting has been a hobby of mine since I was really young. Like 5. Today, I have thousands of baseball cards. Tens of thousands, probably. I have every base set Topps card printed between 1978 and 1991. I have the rookie cards of every member of the 1982 World Series Cardinals team. (My next project should be to assemble all the 1985 Royals rookies.) I have over 100 different cards of my favorite player of all time, Ozzie Smith, Cardinals shortstop in the 80s and 90s. A few days prior to my trip to Washington D.C., I was in Philly at Citizens Bank Park. As I walked the concourse, I came across one of the more impressive memorabilia kiosks I’ve ever seen – and by far the most impressive I’ve seen at a ballpark. The kiosk was owned by Hunt Auctions. They had everything a collector would need: cards, autographed balls and bats and jerseys, a huge selection of World Series pins and programs. And not just current players, and not just Phillies. It was the best of the best. There was a Babe Ruth autographed photo. A Nolan Ryan rookie card I couldn’t take my eyes off. A Stan Musial autographed jersey. And stacks of baseballs signed by everyone from Mickey Mantle to Mike Schmidt. I found an Ozzie Smith autographed ball at the kiosk that I ended up bringing home with me. My collection is mostly 80s cards and current players. It bleeds a lot into the mid- to late-70s and early-90s, but for some reason I have an affinity for those 80s styles. Probably because they’re a good balance between cost and value for my wallet. RBI Baseball probably helps a lot too. The baseball card industry dates back to the late 1800s, but really took off in the 1950s with the introduction of Bowman in 1948 and Topps in 1951. Bowman was bought out by Topps after 1955 which made Topps the only option for the next quarter century. So each player only had one card produced each year. In 1980, Topps lost an anti-monopoly lawsuit, and suddenly two new competitors emerged: Donruss and Fleer. Sure, they had the same guys pictures on it, but I don’t think Donruss or Fleer ever managed to dethrone Topps, At least not in my opinion – all I ever bought were Topps. Still, I wonder of Topps felt a little competition because around the same time they started getting creative with their base sets. Suddenly, Topps was releasing All-Star cards, highlights, record breakers and league leaders from the previous year. They also introduced Topps Traded – a short series after the season that would feature players who had either traded teams or rookies who had been called up mid-season. For example, Ozzie Smith joined the Cardinals in 1982 coming over from the Padres, so his base card is in a Pads uniform and his ’82 Traded is his first Cardinals card. In 1986, Barry Bonds and Bo Jackson got called up to join the Pirates and Royals, so their official “rookie card” isn’t in the ’87 base series, but it is in the ’86 Traded series instead. Topps also launched its Tiffany series which was the same cards only on cleaner and crisper cardboard. Classy stuff. Suddenly a standard Topps complete set might have a half dozen different cards of the same player. Throw in Donruss and Fleer sets, and you could find 15-20 different cards featuring the same star players. But which one was the realcard you wanted? Answer: the earliest Topps card. Those were the “official” rookie cards. And if you have an interest in landing complete sets, the value was defined almost entirely by the rookies in that class (with a little aesthetics thrown in). Here’s a quick list of each year’s biggest rookies with the complete set value (according to last year’s Beckett). Let’s start with Nolan Ryan’s rookie card from 1968. Generally, the value of the sets drops bit by bit each year – which makes sense because older is always rarer and, thus, more valuable. But the value absolutely tanks once you get to the 80s. Sure, they’re way more common, but the fact that there were multiple cards to choose from made each less valuable. There are 5 instances when the value went up instead of down: 1969, 1971, 1975, 1982/1983, 1985. Reggie Jackson is the biggest reason 1969 is so valuable. Jackson was enormously popular with Topps and the public. 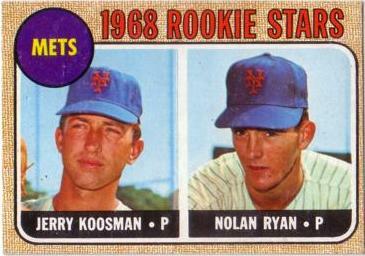 Also it’s the first Nolan Ryan card that he doesn’t have to share with Jerry Koosman. The 1971 increase is tougher to explain, and it’s probably a mixture of things (as all of these are). The lack of names in the surrounding years is probably one reason. You have a huge overlap in players from the previous generation of players (Ernie Banks, Roberto Clemente, Willie Mays) mixed with the next generation (Nolan Ryan, Reggie Jackson, Johnny Bench). The ’71 set also has all black bordering, which makes any dent, scuff or bend extremely noticeable with the lighter cardboard showing through the print. When in good condition, it makes a gorgeous set. Yes, George Brett is one reason the 1975 set is worth more, but it also could be due to aesthetics: the duel-colored ’75 Topps set is a favorite among collectors and Topps still does 1975 throwbacks pretty regularly. The increase in 1982 and 1983 is obvious: Cal Ripken Jr. and the late Tony Gwynn spike those values. The 1985 increase is only by 10 bucks. Apparently Topps believes that Clemens/McGwire/Puckett is a bigger deal than Mattingly/Gooden/Saberhagen. Kirby Puckett passing away may have managed to offset the steroid use of Clemens and McGwire. The sharp decrease into 1986 is probably because Rusty Kuntz Rod Carew retired after 1985. And look how miserable the 1988 set is. The whole set – all 792 cards – is worth a whopping $15. Woof. 1989 Upper Deck ($60): Ken Griffey Jr. When I was a kid, that was the card everyone wanted. It was a huge deal. All the kids wanted Upper Deck and all the kids wanted to be Ken Griffey Jr. It redefined the baseball card industry. I would ride my Dyno bike (no pegs…yet) a couple miles to the nearest card shop (Sports Collectables at 103rd & 69 highway by Skateland South) – and it was all for that UD Griffey rook. I never managed to find one. And when I couldn’t find one, I got tired of spending my allowance on Upper Deck cards of guys I didn’t know or care about. So I jumped off the UD ship and starting buying individual cards of the three players I actually cared about: Ozzie Smith, Bo Jackson and Nolan Ryan. To this day, I don’t own the Griffey rook. Unfortunately, Upper Deck’s success in 1989 had an unintended side effect: suddenly everybody thought they could do what UD had done and the trading card industry became extremely saturated. A year earlier, Score had been launched with not much success – probably due to a lame rookie class. To compete, Topps resurrected Bowman in 1989 as well. If the market was going to be saturated, Topps might as well have a majority share. Leaf – after a couple single-year series in 1949 and 1960 – returned in 1990. Ultra, Stadium Club, Score became Pinnacle, SP, Pacific…suddenly there were dozens of cards of every single player. The industry was flooded with cards. Suddenly everyone had a dozen rookie cards too. Which one was the real rookie card? The answer came in 2002 when Topps began branding Bowman as the rookie brand. They started selling Draft Picks and Prospects cards with the phrase “My 1st Bowman” on the card, featuring players who hadn’t even stepped foot on an MLB field yet. But for most of the 2000s the baseball card industry remained dead. No one wanted cards anymore because 1. The market was still so saturated and 2. all the star rookies from the previous 15 years turned out to have been taking PEDs. The Steroid Era was killing the card industry too. Then in 2009, Topps became the official trading card of Major League Baseball, which put them back on top. Which brings me to Stephen Strasburg, who was drafted that same year, and who, from my perspective, immediately and singlehandedly resurrected baseball cards. In his sophomore year at San Diego State, Strasburg posted a 1.58 ERA with 134 strikeouts in 98.1 innings. The following year, he was even better going 13-1 with a 1.38 ERA and 195 strikeouts in 109 innings. He was, and still is, a strikeout machine. In the 2009 MLB Draft, Strasburg was picked #1 overall by the lowly Nationals. When he debuted in June of 2010, Joe Posnanski called his start the “most hyped pitching debut the game has ever seen.” And he lived up to the hype going 7 IP, 2 ER, 0 walks and fourteen strikeouts. Although he fell a K short of the debut record, he set a new Nats strikeout record that day. And it was only Day 1. From February-June 2010, Strasburg was all it took for me to get I back into card collecting. And more intensely than ever before. I hit every baseball card store in KC searching for boxes of Bowmans, and if they didn’t have them, I’d grab boxes at Target or Walmart instead. I went on a midnight trip in Denver that June and hit 3 different Walmarts looking for that card. It was like the 1989 Griffey all over again only now I was an adult spending a salary instead of an 8 year old spending an allowance. It was Strasburg Fever, and the industry hadn’t seen anything like it in 20 years. In July of 2010, Stras went on the DL with inflammation in his right shoulder. A month later, he returned for three starts, before going on the DL a second time, only this time for much longer. He needed Tommy John surgery and would be out for the next 12 months. As is always the case with pitchers who undergo TJ surgery, there were questions as to whether he would be the same guy when he returned. He came back for 5 starts at the end of 2011 and held opponents to a .179 average, struck out 24 and only walked 2. His ERA: 1.50. Since his injury, he has a 3.10 ERA with 543 strikeouts. His career K/9 of 10.5 is higher than anyone named Scherzer or Kershaw or Lincecum, albeit in less innings. He made his first All Star game in 2012. Not until September 2012, there weren’t. That’s when the Nationals sealed a spot in the playoffs for the first time since their move from Montreal in 2005. But the Nationals didn’t want their top starter to get injured again. He had been on an innings limit during the season, and had reached that limit. 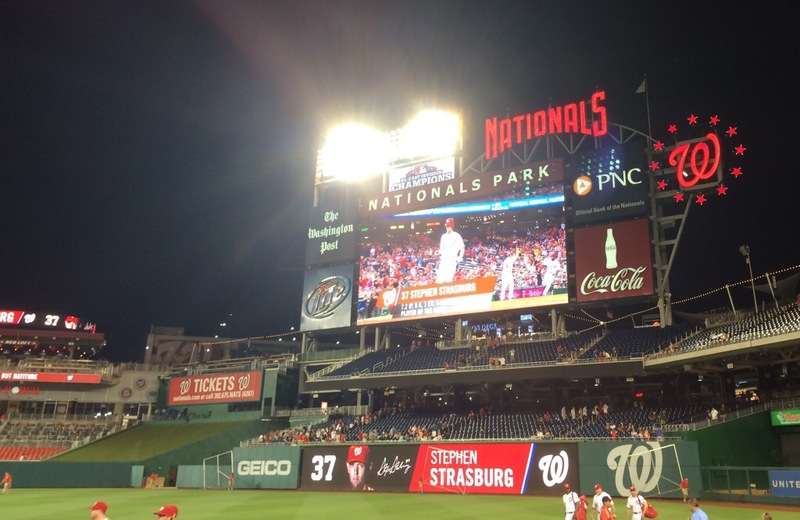 Playoffs or not, the Nats decided to shut down Stephen Strasburg for the 2012 playoffs. Since then, he’s been the same guy the Nationals always thought he would be. He was pitching on Tuesday night in Washington DC. I had never seen him pitch in person, and it was even better than my expectations. He was himself: 1 run on 5 hits with 8 strikeouts in 7.2 innings. His only blemish came in the 8th when he gave up a solo HR to LeMahieu. I was even more impressed with his mechanics. I had my binoculars with me, watching him from the front row of the upper deck. I noticed two dark spots in the dirt in front of the mound and I couldn’t figure out why they were there. I watched him for a while and realized he was so consistent that his feet would land in the identical spot every single pitch. He would plant with his left foot out in front, and his right leg would fly around and plant in the same place on the first base side of the mound every time. It was mesmerizing, really. But it was different witnessing him in person than it was looking at his picture on his 2010 Bowman TCP #1. You see, no matter what collectors might tell you about the worth of their collection or how the 1968 Topps complete set is worth $5k, baseball card collecting isn’t about the their financial value whatsoever. Baseball card collecting is about nostalgia. Card collecting is about recalling memories of ballplayers from the past. It’s about remembering the guys you used to celebrate at the ballpark. It’s about seeing Carlos Zambrano’s face and being filled with anger. 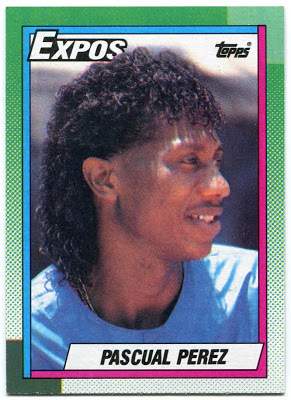 It’s about the day I learned what a Jheri curl was from Pascual Perez’s gorgeous 1990 Topps card, and how hard I laughed at It’s about seeing Ken Harvey’s All Star card and laughing about the time he fell behind the tarp at Kauffman Stadium and got stuck. It’s why I collect Ozzie Smiths and Bo Jacksons and Nolan Ryans. It’s all about my childhood memories. It’s all about the feelings each card sparks inside your heart. As long as I am making baseball memories, I want to have cards that remind me of them. I got home from my East Coast Tour and placed my new Ozzie Smith ball along side the rest of my collection. I remembered traveling with my dad and grandpa during the floods of 1993 to catch a 3-game series in St. Louis. I sifted through my 1982 World Series Cardinals booklet and giggled at the sight of Willie McGee’s goofy faced rookie card. He got called up in 1982 and immediately helped win a championship. I took a look through my pile of Strasburg cards, and noticed something I hadn’t before: new memories. I’ll forever remember how sickly sweaty it was at Nationals Park that day. I’ll remember how we didn’t have enough time to explore D.C. so we had to jump out of the car, run up and take as many photos as we could of the Lincoln Memorial before my phone battery ran out, and then run back to the car. I’ll remember how I was craving Taco Bell the entire time I was in D.C. and as we were leaving town to drive back to Baltimore, right as I had lost hope entirely, we found one. I’ll remember how the employee at that Taco Bell claimed they didn’t have water. It’s about more than the cards and their values. It’s about the sentiments attached to each name, team and year. The reason any of us love baseball cards isn’t because of all profit we’ll all reap when we sell them someday. People used to joke about how our baseball cards would pay for kids college education someday. Well, that didn’t work out. Neither did Beanie Babies. Instead, all my kids are going to get is stacks and stacks of stories about Ozzie, Bo and Nolan. And Ken Harvey. And Stephen Strasburg. I’m not sure what angle I want to play on this chapter for my book. Perhaps legacy or memorial stones. Is nostalgia spiritual? I guess the roots of the word in Greek is “nostos” (to return) and “algos” (sorrow or pain). Which is interesting because typically we associate the word with positive memories. What is the role of nostalgia in our spiritual development? Is there value in longing for the past? In today’s world, there is quite a bit of future focus. Productivity and efficiency are key values in our society. Don’t waste time because you only get so much of it. Which has caused the Church to respond with sermons about slowing down and living in the now. And I think rightly so. It’s important to be present to the moment. Don’t work so hard that time gets away from you and passes you by. Notice the world around you. Etc. But do we spend enough time remembering the past? Is there value in being nostalgic? When is nostalgia helpful? When is it hurtful? What can we learn from dwelling on the past that might help us in the present? And how does this relate to theology, the early church and spirituality? Hmmm. Not exactly sure where this ends up, but it feels like there’s a launching point here. But I don’t have time to flesh it out now. That’ll have to come with a lot of research and writing later. For now, on to some game notes. Like I said, Strasburg was phenomenal: 7.2 IP, 1 R, 5 H, 8 K.
But the Nats offense was hot too and put up runs early. Rockies starter, Christian Friedrich (who was optioned to Triple-A Colorado Springs two days later) walked the first two batters he faced then gave up a double and single to Jason Werth and Adam LaRoche to quickly make the game 3-0 Nationals. The Nationals would add to their lead in the 4th. They started the inning with back to back to back to back doubles by Strasburg, Denard Span, Anthony Rendon and Werth. Here’s another Strasburg memory I’m sure to be nostalgic about someday: him running the bases in the 4th. His leadoff double should have been a triple, but he pulled up at second. Then he only advanced to third on Span’s double. Finally, two doubles after his own, he managed to score from third. A faster ballplayer probably could’ve picked up 6 or 7 bases in the amount of time Strasburg managed 4. It was quite the adventure, and in a closer ballgame the fans wouldn’t have been laughing as hard as they were. 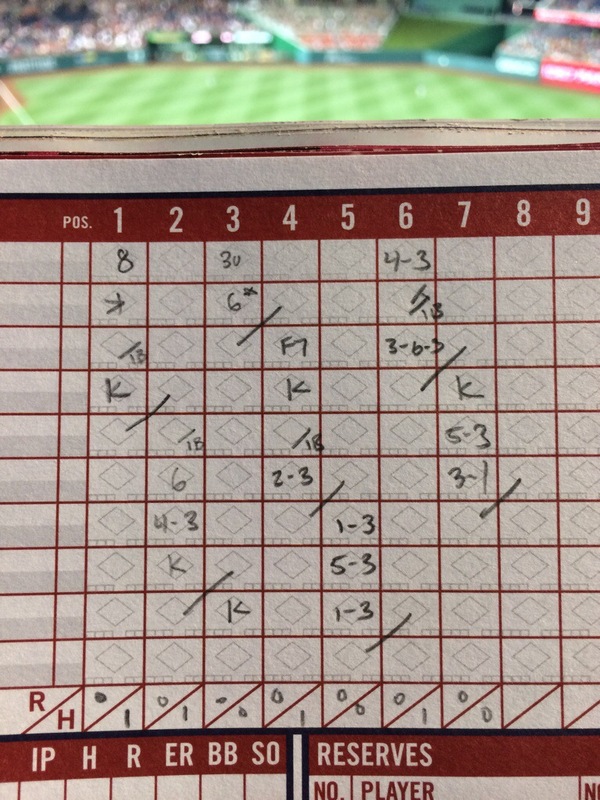 Strasburg gave up a solo shot to LeMahieu in the 8th, but sandwiched two Ks around it for his last two outs of his start. Prior to the HR, he had only given up 4 singles and no one had made it past first base. As the MLB.com headline put it the next day, it was a “Stras-free night for the Nats”. Nineteen Down. Eleven to go. Next Next post: The All-Star Game is meaningful, but it shouldn’t count for anything.